Each of the four elements has its own unique attributes. 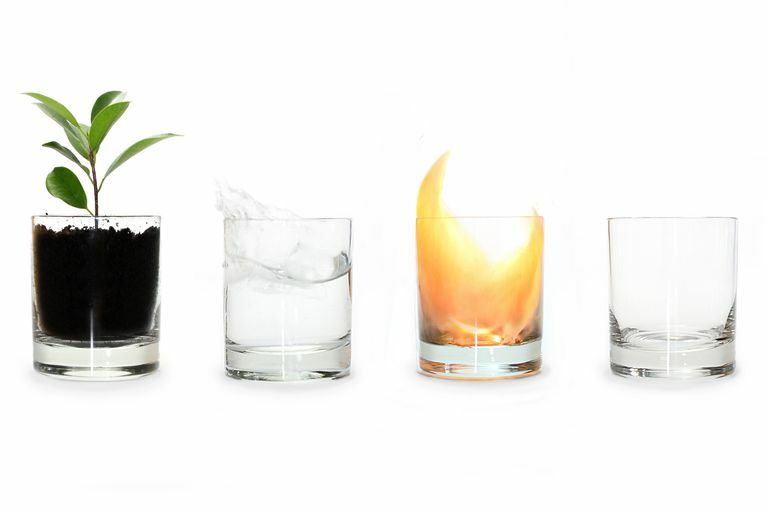 The concept of four elements is hardly a new one. A Greek philosopher named Empedocles is credited with the cosmogenic theory of these four elements being the root of all existing matter. Unfortunately, much of Empedocles’ writing has been lost, but his ideas remain with us today and are widely accepted by many Pagans. In some traditions, particularly those that are Wiccan-leaning, the four elements and directions are associated with watchtowers. These are considered, depending on who you ask, to be a guardian or elemental being, and are sometimes invoked for protection when casting a sacred circle. Each of the elements is associated with traits and meanings, as well as with directions on the compass. The following directional associations are for the northern hemisphere. Readers in the southern hemisphere should use the opposite correspondences. Also, if you live in an area that has unique elemental characteristics, it's okay to include those. For example, if your house is on the Atlantic coast and there's a big ocean right there to the east of you, it's okay to use water for east! Connected to the north, the earth is considered the ultimate feminine element. The earth is fertile and stable, associated with the Goddess. The planet itself is a ball of life and as the wheel of the year turns, we can watch all the aspects of life take place: birth, life, death, and finally rebirth. The earth is nurturing and stable, solid and firm, full of endurance and strength. In color correspondences, both green and brown connect to the earth, for fairly obvious reasons. In tarot readings, the earth is related to the suit of pentacles or coins. Air is the element of the east, connected to the soul and the breath of life. If you’re doing a working related to communication, wisdom, or the powers of the mind, air is the element to focus on. Air carries away your troubles, blows away strife, and carries positive thoughts to those who are far away. Air is associated with the colors yellow and white and connects to the tarot suit of swords. Fire is purifying, masculine energy associated with the south, and connected to strong will and energy. Fire both creates and destroys, and symbolizes the fertility of God. Fire can heal or harm. It can bring about new life or destroy the old and worn. In tarot, fire is connected to the wand suit. For color correspondences, use red and orange for fire associations. Water is a feminine energy and highly connected with the aspects of the Goddess. Used for healing, cleansing, and purification, Water is related to the west and associated with passion and emotion. In many spiritual paths, including Catholicism, consecrated water plays a role. Holy water is just regular water with salt added to it, and usually, a blessing or invocation is said above it. In some Wiccan covens, such water is used to consecrate the circle and all the tools within it. As you may expect, water is associated with the color blue, and the tarot suit of cup cards. In some modern Pagan traditions, a fifth element, that of spirit — also called Akasha or the Aether — is included in this list. Spirit is a bridge between the physical and the spiritual. Do You Have to Use the Elements? Do you have to work with the elements, at least within the classical context of earth, air, fire, and water? No, of course not, but keep in mind that a significant amount of neopagan reading uses this theory as a basis and foundation. The better you understand it, the better equipped you'll be to understand magic and ritual.